The Cooper River Bridge 10K (4-6-13) is an incredible race. The race organizers cap the registration at 40,000 (38,500 regular and 1,500 charity) people and it has sold out the last four years!!! UPDATE: All regular registrations are SOLD OUT! 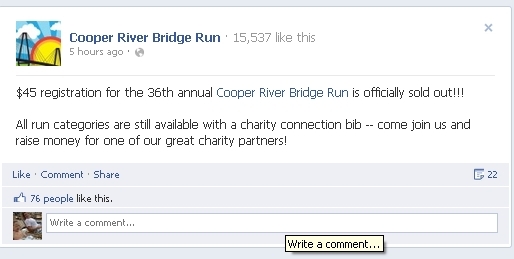 You can still register with a charity bib though. Even though I run over the Arthur Ravenel Jr. Bridge (that's the actual name of the bridge) almost once a week (sometimes more) it is still amazing to do it with 39,999 other people (it used to be more, but they capped it at a lower number). The scene is unreal and something everyone should do at least once (this is will be my eighth time running the race). Here are my tips for making this a great experience. 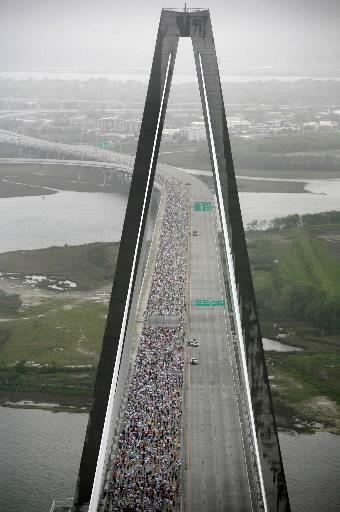 My perspective is from someone who walked the 5K when it was on the old bridge (2006 - its only a 10K now). In 2007 I started in the back corral and finished in 1:17:37 (16,966 overall finisher) and then in 2011 I started in the third corral and finished 48:02 (1,989 overall finisher). 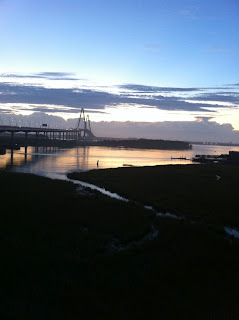 Also, I live in Mount Pleasant (near the starting line) and work in Downtown Charleston (near the finish line). That's me up front in the middle - man I am short! Sign up early. Depending on your expected time, you may get a better corral and you will save some money (the price just keeps going up). Relax and enjoy the crowds. Its a huge race, one of the biggest in the world. 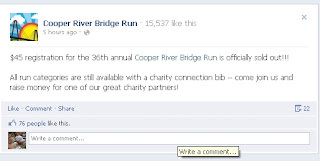 That's one of the cool things of being part of something like the Cooper River Bridge Run. Watch all the crazy people and just laugh. It will get you through some of the lines and the waiting. If you are in town and are near Mount Pleasant before the race, go get your packet at the Bridge Run Store. You don't have to go to the expo! If this is your first time running this race or any big race, go to the Expo! You do not want to miss walking through all the vendors and checking out all the running stuff. There are very few 10K's that offer an Expo as big as this one. Big change this year is that the Expo has been moved to the Charleston Area Convention Center in North Charleston. This is actually a good thing. It has better parking than downtown and its close to the airport for all of you that are flying in. If you go to the Expo, go on Thursday (trust me on this one). Carbo loading is really for races that last over ninety minutes (half and full marathons). Don't stuff yourself on pasta. But if you want to eat pasta, just remember that there are 39,999 other runners out there with the same idea and they have guests too... Okay, if you have to eat pasta then I suggest eating in Mount Pleasant. La Pizzeria is right over the Bridge and Steel City Pizza (used to be Giuseppi's) is on Coleman near Sullivan's Island. Easy and you will get to drive down Coleman Blvd to see the starting line. Organize your clothes the night before. Put your race bib (number) on your shirt. There are no chips to attach to your shoes (its on your bib) so this will save you some time. Oh, the blue Boeing bracelet from 2011 was a flash drive (you did not need to wear it during the race - that still cracks me up...). Last year there was a credit card size flash drive with all the race information on it (please do not wear it on your shoe - although it sure would be funny to see). Eat breakfast. The race starts at 8:00am (well, there are now wave starts so you might start as late as 8:33 - or later). Eat at least two hours before the race. Oatmeal is good, whole grain bread with almond butter and honey is great! Get to the race early! If you park Downtown, either take the shuttle (be in line by 6:00am, they stop at 6:45am - don't be pissed if you show up late and the buses have already left) or get someone to drive you to Mount Pleasant. Same thing goes for North Charleston, Mount Pleasant and Daniel Island. 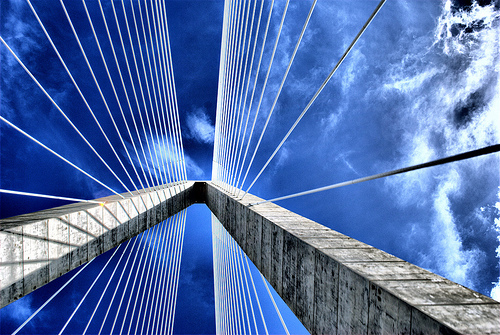 This year there will be a shuttle pick up and drop off from the Charleston Area Convention Center (North Charleston, Mount Pleasant Town Center (Mount Pleasant) and Publix Shopping Center (Daniel Island) - checkout the Bridge Run site for more info, they keep changing it. If you know someone who lives in the Old Village ask them if you can park at their house and then walk to the start. I am hesitant to share this, but if you take 526 to the very end in Mount Pleasant and then get on Rifle Range Road it will take you into the Old Village. Very little traffic and your ride can drop you off near the start... Shhh...Don't tell anyone. Yes its Charleston, but its not Key West. It may be cold at the start. Bring a throw away sweatshirt so you stay warm until the start of the race (sweatshirts are about $4.00 at Goodwill and some are fun to wear for a few hours - just ask that guy that sings Thrift Shop). The Old Village is a great place to do a warm up run. Use the bag drop off (sweat shuttle). You can pack a jacket or what ever else you might need at the end of the race and be able to enjoy the finish. The truck will be near the starting line. The pick up point will be in alphabetical order near Embassy Suites straight up Meeting Street (very easy and very organized). Get in your corral as soon as possible. Enter from the rear and move as far up as you can (in your area). 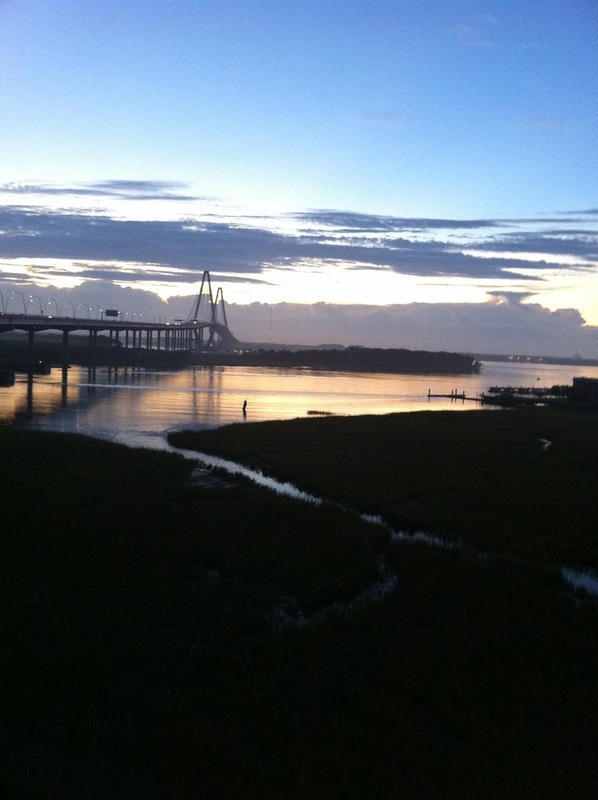 Mile One - this is mostly down hill, but look out for the median after the Shem Creek Bridge. As funny as it is to see hundreds of people tripping over it, I don't want someone who reads my blog to bite the pavement or slam into a lamp post. Mile Two - You will start hitting the incline at the end of this mile. Again, not really a tip just wanted you to know. 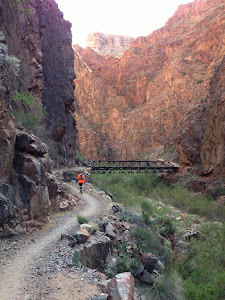 Mile Three - you will be on the Bridge at this point. You are going to hear a bunch of Garmins going off before the mile marker (this happens every year - not sure why the marker is off). Anyway, its less than a mile to the top from this point! Push through this and it is smooth sailing down the Bridge. Mile Four - the top of the Bridge and the decline. Don't take it easy here. 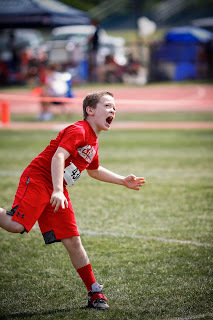 Run like a kid! You don't have to come back up, so have fun running. Mile Five - you will still be going down hill, but this is where the off ramp is located. Don't stop to sample the energy drinks or eat a donut at the bottom of the ramp. It will waist time and you will feel like crap afterwards. Mile Six - I love this part of the race. The crowds will be cheering like crazy and you will go past the finish festival (the Kenyans will have already showered and cashed their checks at this point). The Finish Festival is great! There will be plenty of food and water (as long as the idiots don't hoard the food and water). Tell your friends where to meet you before you leave them. Its crazy and you need to be specific (the bright orange TrySports tent is a good place). Check out the bands and just relax and enjoy the finish. Cheer on others as they come in. 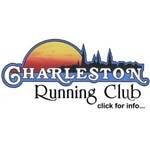 If you are local (or not) join the Charleston Running Club. Yes, they have great meetings and races. But the CRC Tent at the finish festival is awesome! For $25 ($30 for a family membership) you get a year's membership and you get to have breakfast at their tent! I know this sounds crazy, but its well worth the money. Don't rush to get back to your car. Relax... If you parked Downtown, you are already there. If you parked in Mount Pleasant, you have a few options. You can run back (really, there are a ton of people that do this every year, just head to East Bay Street and follow the sidewalk to the Bridge). Or you can take the bus back. There are free buses (school buses) that shuttle thousands of runners back to Mount Pleasant (also North Charleston and Daniel Island starting this year). Here are two things you need to know. First, wait until the Bridge has opened before you take the bus back to Mount Pleasant. If not, they will drive all the way around 526 to get back to Mount Pleasant (not a problem for North Charleston and Daniel Island). Second, the bus drops you off where ever you got on (well depending if you read the sign and get on the right bus). So if you parked near the starting line (or the Old Village), you are going to have to walk several miles back to the Town Center. Make sure you plan this out before race day so you can find your car (you will notice the thousands of people who did not read this blog wondering around trying to figure out where they are). There was is a new Bridge Run App available last year (not sure if there will be one this year). I tried it and it was okay. The download is free, but to get the cool stuff it is going to cost you $1.99. You can set it up to track your splits as well as anyone else running the race (I set up four people in my favorites and it looks like I could add more). It also has a place for results so you won't have to look all over the place to find your official time. It was a little slow after the race (too many people in one place I think), but it was fun to look up times later. 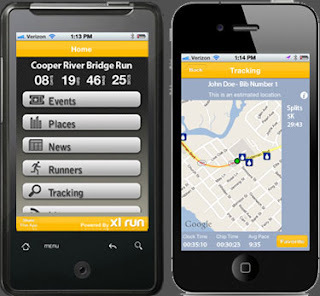 Don't forget to the check the Bridge Run site for the most recent updates (they also have a Facebook page too) and the Post and Courier (make sure you pick up the Thursday paper before the race and the Sunday paper after the race). If you have more tips or better tips please add them in the comments and I will try to include them next year. 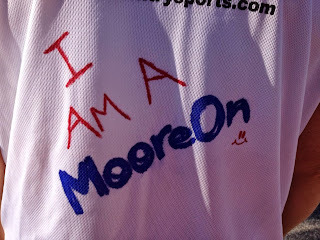 I will send out updates on Facebook (www.facebook.com/mooreonrunning) and Twitter (@mooreonrunning) closer to the race. Know someone who wants to start running just like you? Send them a link to my Couch to 5K class starting May 5th! Thank you for reading my blog and giving me a place to share my joy of running! 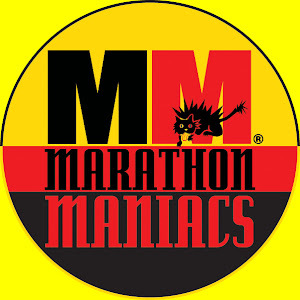 If you like my blog and would like to show your support please click on this link "The Top 100 Running Sites" and click the "Click Here to Enter!" button to vote for MooreOnRunning. Thanks again for stopping by. 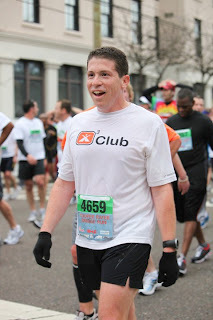 I signed up for the Cooper River Bridge Run this year, and it will be my first (first 10k and first time on the bridge run). This blog is full of wonderful information that I've been searching for! Thank you. Thanks Julie! First for both is awesome - good luck on your race! i would love to find good info about parking my car. the last 2 years iv been parking at patriots point and riding bus to start. then riding boat back to car. this year the point was blocked off and told i couldnt part there. (did anyway). i had no other plan. it dont make any since you buy a boat ticket and cant use the lot? 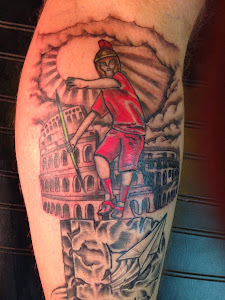 I want to do the right thing next year.Herd there where problems with buses and Colosseum. I cant ride a bus for long i get motion sickness..Where can i find this info.? I think you should park in the Old Village somewhere behind Moultrie Middle School. That will put you near the starting line. That will put you about 1.5 miles from Patriots Point so if you want to take the boat back its not that long of a walk back to your car. The other thing you could do is park near Mustard Seed in Mount Pleasant and walk to the starting line (half a mile) and then take the bus (marked Mount Pleasant Starting Line) back to Mustard Seed. The trick is to wait downtown long enough so the Cooper River Bridge is open and you don't have to ride the bis all the way around 526. It make for a much faster ride, but you will have to stay downtown until at least 11:00am. Last option is to park your car downtown the night before and have someone drive you to the starting line the morning of the race. That way your car is already waiting for you at the end.